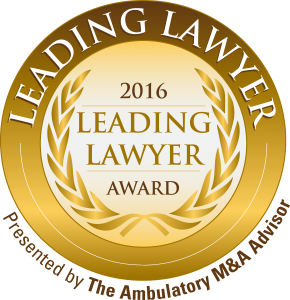 Dallas, TX, December 15, 2016 – The Ambulatory M&A Advisor is pleased to announce the unveiling of the 2016 Leading Lawyer Award recipients. This is a prestigious award that serves to recognize healthcare transactions attorneys who have achieved a high degree of recognition and success within the field. Selection as a Leading Lawyer is great social confirmation, it outlines to peers, referral sources, as well as potential clients, your credentials and presence among the industry leaders. The recipients of the 3rd annual Leading Lawyer Awards have been nominated by colleagues and clients who have recognized the professionalism and achievements in the healthcare field that have been made in the last year. 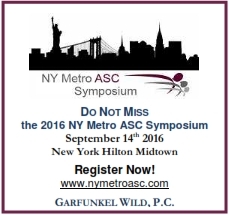 The categories for the award include: Leading Lawyers, Rising Star, and In-House General Counsel. Recipients of the Leading Lawyer award are employed full-time at a law firm, have partner status or above, have 10 or more years of experience with healthcare transactions and practice with a focus on M&A. 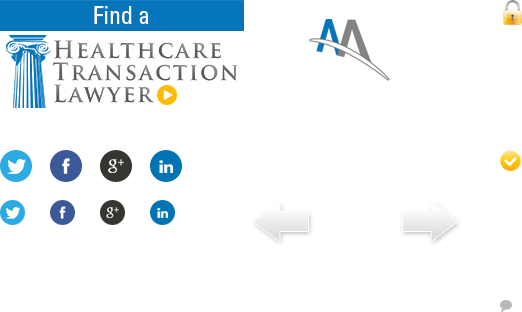 Recipients of the Rising Star award are employed full-time at a law firm, have less than 10 years of experience with healthcare transactions and practice with a focus on M&A. Recipients of the In-House General Counsel award are employed full-time by hospital health systems or healthcare service entities, are at an Associate General Counsel level or above, have 10 or more years of experience with healthcare transactions and practice with a focus on M&A. For the complete list of the 2016 Leading Lawyer Award recipients, click here.